I’ve mentioned before that I’m working on some PowerShell cmdlets for WebSphere MQ. I thought I’d pass on a few tips that I picked up this week on improving the usability of the information displayed by Get- cmdlets in PowerShell. Windows Mobile – like standard Windows – has a default “file open” and a “file save” dialog that all applications can use. If you’re writing an app, you can use it in your code with just a few lines. Great! Except… no. Because they’re rubbish. This has come up as an issue raised with a couple of apps that I’ve written that use the standard dialogs. I would defend my apps by saying that I didn’t write the dialogs, and that they’re the same that you get in other Windows Mobile apps like Microsoft Word Mobile. But I can’t, really. For a user, this is just an excuse. Wherever the dialog came from, it is rubbish. I’ve written a couple of new ones for use in my applications. They’re fairly small, so I’ve made them available if anyone else wants to use them with their apps. In this post, I’ll quickly outline what is wrong with the standard dialogs, and introduce my new ones. I took a break from playing with the Android SDK for the first time tonight by making a quick update to my Windows Mobile notepad app. Previously, to open files I’ve had to launch the notepad, then use File -> Open and choose my file. I wanted to register the .txt file extension with the notepad app, so that I can open files in the notepad by clicking on them. It’s a fairly straightforward thing to do, but I thought it might be helpful to share. I couldn’t find much information about it, but it’s fairly simple to work out if you use Visual Studio’s Remote Registry Editor to see how other apps do it. My impulse control issues regarding anything small and gadget-y continue. 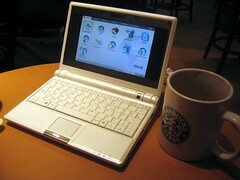 I’m now the proud owner of an Asus EEE PC – the new Linux sub-notebook with a solid state hard-drive. It seems to be getting a lot of press at the moment (I’ve been seeing reviews pop up all over the place – like PC Pro and TrustedReviews while I’ve been waiting for my pre-order to wing it’s way to me) so I’m reluctant to write yet another review. But I just couldn’t resist the excuse to make a few comments and take a few photos of it! Spam email is normally fairly annoying, but every now and then you get one that is so bad that it’s actually kind of entertaining. You are require to contact the delivery manager for verification and authentication of your claims as the sole beneficiary with your personalinformation. Fundraisers should stop using incentives, such as pens and coins, in their fundraising packs unless they are relevant to the charity’s cause, charity direct marketing experts have told the Institute of Fundraising. This makes sense to me – I’ve often thought it felt all too easy to do this stuff, and that more consideration should be taken about the benefits of these promotional items weighed against the cost – to make sure that they are not a waste of money. They sent me a stack of Christmas cards, and some little diary/calendar things. And an invoice – prefilled so I could just write a cheque and send it back. If I wanted more, I could order more. If I didn’t need all of them, I could send them back. Am I turning into a grumpy old man (entirely possible) or is this more than a little annoying? An organisation I had never heard of before sent me a bunch of stuff that I didn’t ask for or want, together with an invoice. And it’s up to me to go to the trouble of sending it back. It’s an interesting perspective, though – we’ve put a lot of effort into doing mailshots in the past. It’s always hassle and tiring, and in all the effort it’s easy to lose sight of how it might be received. This sort of thing can have a big impact on people’s perceptions of your “brand”. For the next couple of days, I will be mostly skiving. We’re doing the “z/OS Real-world Challenge” – a fairly shocking name, but the idea is that we get a few days out of the office to brush up our IBM mainframe sys-admin skills. We will be given a pretend scenario detailing customer requirements, then have to work out what we need to satisfy them – including how to install, set-up and configure any products that we need. Not sure what we will be using, but it’s apparently a safe bet that it will include JCL, Java, WAS, DB2, COBOL, Assembler, CICS and WebSphere MQ among others. At the end of it all, our efforts are examined and graded by some more experienced architects. It’s a chance for us to try our hands at some new things, as well as test some of our preconceptions on the best way to use products that we think we know. Should be fun! I blogged back in the summer when I was starting to think about overhauling the I.T. infrastructure for my youth charity, Solent Youth Action. But I never actually came back to this to say what I went with in the end. You can see the original post to see what we started with, but in short, it was fairly primitive.